Fashion Design faculty, Li-Fen Anny Chang, received recognition of the top 15 artists, architects, and designers in the CURATE THIS! 2010 International Public Vote. The contest was organized by B E C A - Bridge for Emerging Contemporary Art, http://www.curatethis.org/. Over 2,000 votes were cast from 19 countries. As a result, Anny received 8th Place. Visit http://campaigns.ratepoint.com/campaigns/0be4be84f36d3449d1122f0751191110 to view the result of the contest. Visit, http://www.curatethis.org/participating-artists-and-designers.php to view the works of artists, architects, and designers. 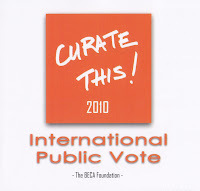 The top 15 vote receiving artists, architects, and designers were featured in the 2010 publication of CURATE THIS! which was released in November, 2010. To preview the book, visit http://www.blurb.com/books/1690020. In addition, Anny was selected by Dr. Helen Pheby, Senior Curator of Yorkshire Sculpture Park (http://www.ysp.co.uk/), as one of the artists of the CURATE THIS! 2010 New Art Publication. To preview the book, visit http://www.blurb.com/books/1727277.